The sixth grade students at Hunt Middle School have been learning about the great Halifax Explosion of 1917: an event that few people beyond Nova Scotia have heard of. The explosion in 1917 was the largest man-made explosion ever; only the atomic bombs of Hiroshima and Nagasaki have surpassed it. Nearly 2,000 Haligonians were killed and 9,000 injured. African-Nova Scotians and the First Nations Mi’kmaq were also victims, but relatively little was reported about their losses. In addition to reading and writing about the event, Team Synergy students have been researching why more has not been written the African-Nova Scotians and Mi’kmaq people whose communities were also devastated by the blast. On December 6th, on the 100th anniversary of the explosion, the students attended, via CBC livestream, the Commemorative Ceremony held in Halifax. 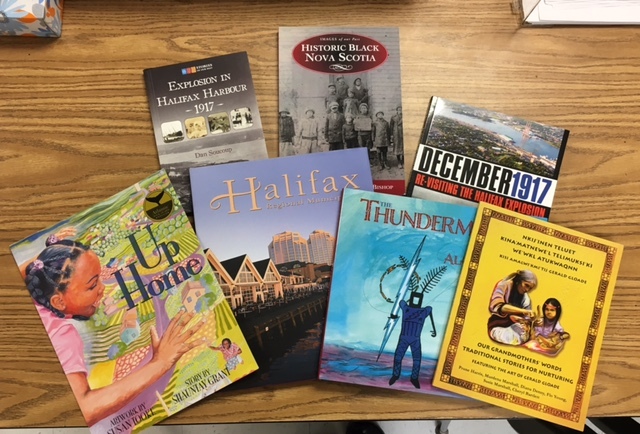 The Halifax mayor’s office learned about their study and involvement, and, this week, they received the most wonderful gift: Over $100 worth of books about the city, books about First Nations people and African-Nova Scotians, and books about the Explosion. They sent every child a beautiful Halifax lapel pin and also a Halifax button. Finally, the mayor wrote a letter of greeting and congratulated the students on their interest in this event. The Burlington School District is happy to congratulate the sixth graders at Hunt Middle School for a job well-done. Thank the mayor of Halifax for this generous gift.